by Laura & Don Paulino! Her glasses are included with her BUT the Chair is NOT INCLUDED. 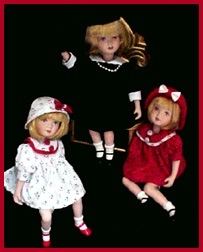 Almost 10 inches tall seated, she wears a white cotton dress trimmed with red cherries with green leaves, a red trim and red buttons. She also weats white cotton pantaloons trimmed in lace. Her versatile cotton hat is a matching print with red bow trim. She is ALL porcelain and handpainted. Her legs and arms are attached with heavy cord, and she can easily be placed in natural poses! He head is jointed as well. 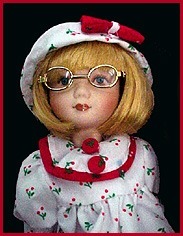 She is very studious and wears glasses with real lenses! (which of course can be removed). Her shoes and sox are sculpted and painted. There is no indication of the name on the doll or the box, therefore she is suitable for any child if you would like to personalize her. SALE PRICE WITH GLASSES $24! New from gallery stock. She comes in her cellophane window storage box. Buyer to pay $5.00 Priority Mail Insured USA.